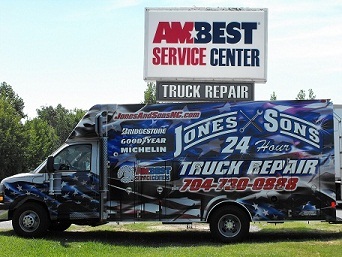 Jones & Sons Truck Repair operates Six Ambest truck service centers in the Carolinas, located in Kings Mountain NC, Mocksville NC, Nebo NC, Florence SC, Hendersonville, and in Charlotte NC (as Diesel Doctors). Our technicians are highly trained to get your vehicle back on the road with minimal down time. We specialize in Fast 24 Hour Emergency Road Service for all makes of trucks and trailers! In addition to our 6 locations, we have 30 service trucks located throughout the Carolinas so we can provide a quicker response for you. We are a proud dealer of Bridgestone, Michelin and Goodyear truck tires, and offer heavy duty towing. It’s true you only have to MAKE ONE CALL, WE WILL HANDLE IT ALL!! AMBEST Service Centers are America's BEST Service Centers with 67 locations across the United States. When your truck needs maintenance or repairs, driving back to the terminal isn't always an option. You want to get it taken care of right away at a facility you can trust. NOW YOU CAN! AMBEST Service Centers are certified by AMBEST, America's BEST Truck Stops, with a reputation for excellence. We involve YOU in the work on YOUR TRUCK so you can rest assured that only the maintenance you request or repairs you approve are performed. Our pricing and guarantee is good ACROSS THE COUNTRY at all AMBEST Service Center locations. Kings Mountain NC: 704- 730-0888, I-85 Exit5, 416 Dixon School Road, Kings Mountain, NC 28086, provides truck service to Kings Mountain, Shelby, Gastonia, Lincolnton, Dallas, Cherryville, Forest City, Rutherford NC, Blacksburg, Cowpens, Gaffney, Fort Mill, Rock Hill, and York SC. Mocksville NC: 336-751-0011,I-40 Exit 170, 133 Avgol Dr. Mocksville NC 27028, provides truck service to Mocksville, Winston Salem, High Point, Lexington, Salisbury, Statesville, Troutman, Mooresville, Hamptonville, and Yadkinville NC. Nebo NC: 828-659-2909, I-40 exit 90, 2761 Harmony Grove Rd., Nebo NC 28761, provides truck service to Nebo, Marion, Morganton, Hickory, Newton, Conover, Catawba, Maiden, Lenoir, Spruce Pine, Burnsville, Black Mountain, Asheville, and Rutherfordton, NC. Florence SC: 877-734-0026, I-95 Exit 169, near I-20, 161 W McIver Road, Florence SC 29501, provides truck service to Florence, Darlington, Dillon, Lumberton, Laurinburg, Bennettsville, Cheraw, Hamlet, Rockingham, Pageland, Lancaster, Bishopville, Camden, Sumter, Manning and Lake City SC. Charlotte NC: Diesel Doctors (a sister company) 704-921-2100, I-85 Exit 40, near I-77, 4200 Joe St, Charlotte NC 28206, provides truck service to Charlotte, Concord, Harrisburg, Kannapolis, Salisbury, Lake Norman, Huntersville, Cornelius, Davidson, Mooresville, Troutman, Statesville, Denver, Lincolnton, Gastonia, Belmont, Mt Holly, Pineville, Matthews, Mint Hill, Monroe, Indian Trail, Weddington, Waxhaw NC, Lake Wylie, Fort Mill and Rock Hill SC. Hendersonville NC 828-659-2909 1-26 Ext 53: Western NC and Upstate SC; Hendersonville, Columbus, Asheville, Saluda, Candler, Canton, Waynesville in NC. Campobello, Landrum & Spartanburg in SC.